Before the season began I decided to try to do something a little different by charting some of the things you don’t regularly see in box scores and the end result was some really interesting numbers that may change the way you feel about certain players. I covered most of this last week, but they’re worth repeating. Even though he had the best completion percentage by a large margin, Brian Hoyer was the Bears least-accurate quarterback. I had him as being inaccurate 29 percent of his passes, two percentage points worse than Jay Cutler and five worse than Matt Barkley. Part of this was the number of passes Hoyer simply chucked into the stands. When I first started charting Hoyer, I noted the throwaways, as the season progressed it became more and more difficult to tell what passes he was throwing away and which ones he just wasn’t close to where he needed to be. Quite often, the passes he threw 10 feet in the air could have and should have been completed. Barkley had the best accuracy rate, even though he completed less than 60 percent of his passes. Drops were the biggest reason for this, we all remember the Titans game and that was just the start. Still, when Barkley missed, it was catastrophic as he was intercepted on over six percent of his passes. Offensive lines always deserve credit when a running back has success, but Jordan Howard was an absolute stud. I charted Howard with forcing 68 missed tackles this season. No other Bears player even had 10. As DBB readers know, I was on Howard from the draft, but I never imagined he would have this kind of impact. Second on the team in missed tackles forced was Jeremy Langford with eight, while Cam Meredith had six and Ka’Deem Carey finished with five. You all know how badly Josh Bellamy struggled with drops. I had him with eight on the season, the most on the team with drops on 21.1 percent of his targets. Bellamy is a terrific special teams player and made quite a few big plays too, if his hands were even adequate, he’d be a good receiver. But they’re not. 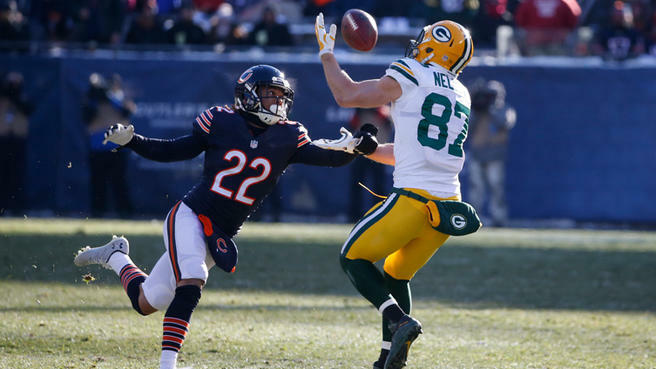 I had Cameron Meredith with seven drops, but he also led the team in targets and had a drop rate of 7.3 percent. Howard had a drop rate of 12 percent, with six on 50 targets. The real reason I wanted to chart was for the guys in the trenches. Unless you re-watch every play multiple times, you don’t really know what kind of job they’re doing. Well, I did that and charted both the negative runs and passing plays. While Pro Football Focus — the same website that convinced hundreds of people that Brian de la Puente was the best center in the league — had Cody Whitehair as one of the best run-blockers in the league, I had him down for 22 bad runs, the most on the team by a wide margin. What I didn’t chart, however, was the number of times Whitehair knocked his guy back to the second level. He struggled with consistency and seemed to get beaten at the snap at times — likely part of the struggle of playing center for the first time — but he improved as the season progressed. He didn’t give up much as a pass blocker, allowing just five quarterback disruptions this season. I have no doubt that the Bears have a stud and he’s going to be their best offensive lineman going forward. Bobby Massie was a whipping boy early in the season, but he played really well the last 14 games. In all, he was responsible for 30 QB disruptions and five bad runs. On the other side of the ball, the Bears pass rushers were dominant at times, but none of them were consistent. Willie Young got off to a fast start, but disappeared down the stretch. In all, he led the team with 37.5 disruptions, ahead of Lenny Floyd’s 32.5. Young had a lot of hurries, but didn’t actually get to the quarterback that much, I had him with a total of 14 QB hits, while Floyd was at 13.5 and, despite missing a lot of time, and McPhee was at 11. McPhee was boom or bust as he only had seven hurries for 18 total QB disruptions. Akiem Hicks provided more pass rush than I thought he could. The veteran defensive lineman had 14 hurries and six hits in addition to his seven sacks. In very limited action, Eddie Goldman had 7.5 disruptions. Cornelius Washington rarely got to the quarterback, but he had 10 hurries and drew three holding penalties. Nick Kwiatkoski missed more tackles than any player on the team with 11, seven of which came in one game, but that doesn’t mean he was a bad player. Since Week Four, I had him with 10 stuffs (tackles for one yard or less), the most on the team. Danny Trevathan and Jerell Freeman were also among the team leaders with eight and seven. The biggest weakness on the team this year was the secondary. While safety play has been a problem for a decade, the cornerback play was just as bad and I don’t think the Bears have any answers on the roster. Tracy Porter regressed to the player he’s always been and is best suited as a third cornerback, not a first. Porter was still their best cornerback, but teams hit him for 30 passes for 505 yards. (Note: I didn’t credit/blame a completion on a player unless I was absolutely sure it was his fault. ). Those were both the worst totals on the team, but only because he played far more snaps than anybody else on the entire defense at nearly 90 percent. Since nobody else could stay healthy, Cre’von LeBlanc was second on the team in total snaps was roasted worse than anybody else. Playing just under 65 percent of the team’s snaps, LeBlanc was responsible for 17 catches for 324 yards. That, of course, doesn’t include the numerous other times he was beaten and the receiver either didn’t make the catch or the quarterback missed the throw. Worth noting that the Bears didn’t plan on playing LeBlanc. Even in Week 17 he was their fourth cornerback, playing behind Porter, Johnthan Banks (not to be confused with the dude who played Mike Ehrmantraut), and Demontre Hurst. Jacoby Glenn and De’Vaunte Bausby were absolute nightmares, neither played even 23 percent of the snaps and both gave up more than 10 catches and 100 yards. Bryce Callahan was at about 45 percent of the team’s snaps, giving up 15 catches for 181 yards. The biggest mystery of the 2016 season is why the team didn’t play Deiondre’ Hall, who had twice as many PBUs and INTs (four total) as he did catches allowed. The safeties weren’t much better. It’s hard to know what to blame them for, but I had Harold Jones-Quartey with nine catches for 118 yards, Adrian Amos with five for 93 and Deon Bush with three for 30, but it seemed he was out of position a fair amount. Just as big of an issue was missed tackles as Amos had four, while both HJQ and Bush managed three. Not good for the last line of defense. All three players are young and could see a drastic improvement, but the Bears have to bring in a starter somewhere and let the other three compete for one spot.